Suffolk’s impact in Boston reaches far beyond the many buildings they have constructed in the city’s beautiful skyline. The company is comprised of a talented, energetic and community-minded workforce that has forged a strong partnership with Boston Medical Center spanning nearly 20 years. Its dedication to BMC’s low-income patients is evident both in the crucial dollars they have provided to the hospital and the army of eager employees who volunteer in programs that greatly benefit BMC patients and bolster the community at large. Suffolk’s contributions to BMC have been numerous over the years. Chairman and CEO John Fish served as BMC Gala co-chair in 2014, helping the event set a fundraising record that year. Suffolk Manager of the Northeast Region Angus Leary serves on the Philanthropic Trust Board and is co-chair of Sweet Feet for Strikes (formerly the BMC Mayo Bowl). The company recently donated a generous $1 million toward the hospital’s Building the New BMC campaign to centralize and transform patient care settings across the hospital’s campus. 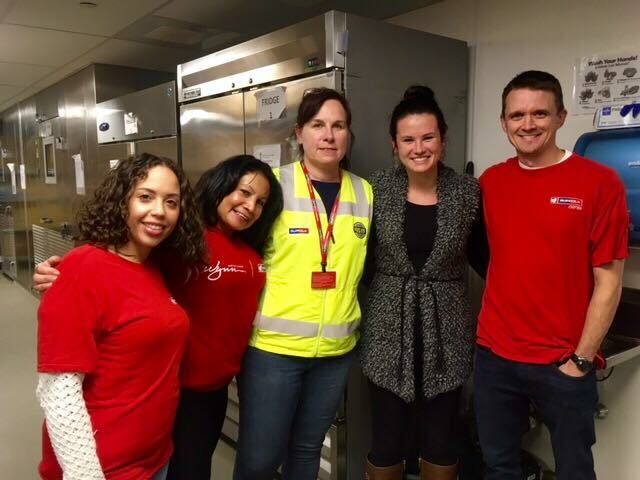 Last November, a group of energetic Suffolk volunteers were at the forefront of the BMC Food Pantry’s annual Thanksgiving meal distribution. The staff donated, packaged and helped distribute more than 850 Thanksgiving dinners, which included a turkey, stuffing, cranberry sauce and butternut squash, for Food Pantry families. Beyond volunteering for the Food Pantry, staff regularly run the Cancer Center’s Celebration Cart, which brings snacks and care items to patients in the chemotherapy bays. Suffolk is currently forming an opportunity in its employee health and wellness program to participate with Team BMC in hospital fundraising athletic events, including Rodman Ride for Kids and the Boston Marathon. “It has been an absolute honor to serve as one of Boston Medical Center’s leading corporate sponsors and longstanding partners. Suffolk and Boston Medical Center share the same core values, sense of caring and forward-thinking vision for this community, which is what makes our unique bond so special. We appreciate our association with BMC and look forward to strengthening our meaningful relationship on behalf of the community for many years to come,” says Shawn Seaman, Suffolk’s vice president and chief operating officer of the Northeast Region. BMC depends on strong corporate investments like Suffolk’s to maintain and build its social service programs in the community. This “stronger together” approach ensures healthy futures for BMC patients and a thriving community in greater Boston and beyond. BMC has a long-standing commitment to serving vulnerable populations, which includes treating both medical needs as well as underlying social determinants of health. The Food Pantry and Demonstration Kitchen play a key role in carrying out this mission. From event sponsorships to cause marketing programs, there are countless ways for corporations to get involved at Boston Medical Center.